Everyone can charge a smartphone using a charger; but have you ever wondered what if you are stranded on an island, and there is no electric power? Smartphones can certainly be a huge help during an emergency, but about this emergency when the smartphone goes out of power? We have tried to come-up with some unconventional, unorthodox ways using which you can charge a smartphone, without using electricity! Please note that some of these methods are still in the experimental stage, and can take some time to get materialized. Researchers from England’s University of Bristol and Bristol Robotics Laboratory are right now researching ways to convert your urine into a power source. Phase 1 of the project: ‘Urine-Tricity’ is over, and now they are into phase 2 of their project. The whole concept is based on Microbial Fuel Cells (MFCs), which can create an alternate source of power when urine flows through them. When microbes encounter urine, they consume them as part of their metabolic process. As soon as microbes consume the urine, they release electrons which are captured by an electrode connected with the MFCs. Soon the circuit is completed and electricity is produced. Once this project gets due approvals, it can be really easy to charge a smartphone; you know what to do in case of an emergency! Wind Farms are an excellent alternate source of power, which is gaining traction all over the world. But can winds be used to charge a mobile phone? 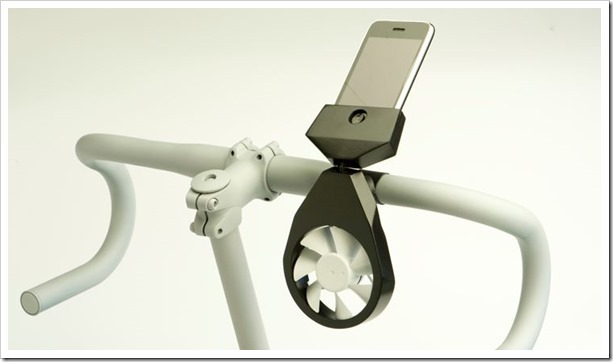 Tjeerd Veenhoven from The Netherlands had created iFan, which uses wind power to charge up an iPhone. Using the computer fan which is found in every desktop and laptop, he has designed a system wherein iPhone can be charged within 5 hours. The condition is that the device should be able to get winds in order to get the power generated. One suggestion as shared on his blog, is to tie up the device on a bicycle or a car. As the vehicle moves, wind would be directly available to the device and your mobile can keep on charging. Pretty neat idea! Doctors all over the world fume over carbonated drinks which are full of sugar and fat. But a Chinese designer has come up with a tremendous idea to charge a mobile phone (using Bio-batteries) with Soft-drinks. 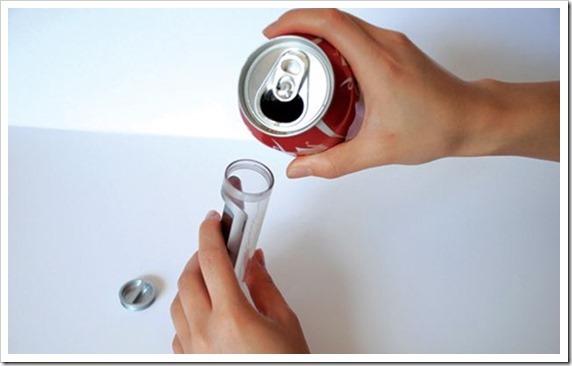 Instead of drinking, the phone user needs to pour soft drinks in a special cell which transforms the energy released by soda, sugar and carbons to create electric charge which can easily charge a phone. In this blog, he has demonstrated the usage on a Nokia feature phone. Once the charge finishes, only water and oxygen remains, thereby making it economically sustainable as well! This method would be a sure shot hit among Indian ladies when it is finally launched: Pan Charger. A Japanese innovation firm has created a pan charger which can use heat to produce enough energy to charge a phone. The Pan Charger, as the name coined by their CEO, is made up of base which contains strips of ceramic thermoelectric material. The temperature differentials and the 100 degree C water inside the pan allow the device to create power, which can be extracted using a USB device. Any device which can operate on 2W/400mA can be charged on this pan. In fact, it is estimated that an iPhone can be charged within 5 hours! Can energy produced by shouting used to charge a phone? Researchers at South Korea’s Sungkyunkwan University are actually conducting research into this hidden source of power. But there are several problems with this theory; for example, a prototype device needs atleast 100 decibels, which is the equivalent of noisy traffic or a jet passing overhead — to generate 50 millivolts of electricity. Such small energy can no doubt help the battery of a smartphone but cant charge it fully. A typical battery needs 5 to 10 volts to get charged up. Scientists from Korea have placed two electrodes which are connected by minute nano-strands of zinc oxide. When a human being shouts, then the vibrations caused by the sound are absorbed by these nano-strands which produces energy. In fact, other background noises such as traffic noise etc can also be used to generate this energy. Research is still on, but it ‘sounds’ very interesting! Earlier we had reported some other unconventional methods to charge a phone such as shoes, sun glasses and nano-crystals. We hope that some of these methods are actually adapted and mass-produced so that our dependence on electricity is lessened, and we have ample options to charge a mobile even if we are left stranded on an island. Do you know of any other method to charge a mobile besides using direct electricity? Please share your views and insights right here! Just as we recharge our phones by dialing numbers from different Service providers,we too can think of recharging our phones on that way..We can tap ions in the ionosphere area of our atmosphere,and convert the Electrical energy into Chemical Energy.. I To Know More About Those Technologies So Teach Me More. what was the result of your try??? @Mohul: brother, I am getting addicted to your stories. Where do you such ideas? I am a would be writer, and I want to learn from you.